This knapsack…er…this “roundish” big baby cradled by a volunteer is Goldie, a six-year-old, incredibly affectionate furbaby who has been waiting in a cage at the Mandaluyong Animal Shelter (MAS) for six years. You can just imagine how he looks forward to the visits of volunteers who let him out for brief, lovely moments of being hugged and walked. This must be why he clings so tightly, asking not to be let go. It is so cute but also heartbreaking. This pudgy pooch is neutered, microchipped, has rabies and 5-in-1 shots annually, and dewormed two to three times a year. According to volunteers, “He’s easygoing, with no mean bone in his body.” He is “maybe too submissive for his own good (poor guy doesn’t fight back when other dogs bully him). He’s friendly with all humans, gets along with other dogs (just no bullies please) and even tries to befriend the alley cats (got swiped on the nose but didn’t even get mad). Goldie was still slim three years ago. Won’t you help give Goldie the best Christmas present ever, a furever home? To adopt Goldie or any of his MAS buddies, email helpmasdogs@­gmail.com. Adoption procedure is as follows: meet & greet > application form > interview > 2 bonding visits > home visit. To clarify, Mandaluyong Animal Shelter is a dog pound where unclaimed dogs are euthanized regularly. A few dogs, including Goldie, escaped this grisly fate in 2013 when the volunteers formed the Help MAS Dogs group to seek an exemption for the few dogs they had already spayed/neutered, vaccinated, and rehabilitated. These volunteers had since been looking after these dogs. You may visit their page here. 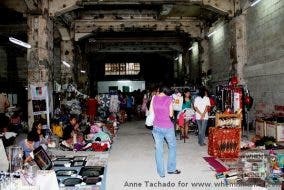 A Look Inside Julia’s Closet: Makers of High Quality Filipino Made Fashion Accessories!